Data losing happens here and there in the digital portable life. So as an iDevice user, we strongly recommend you to find a data recovery program for your iPhone, iPad or iPod touch as your daily assistant. The types of files on your iPhone, iPad or iPod is definitely different. So in order to satisfy your different recovery needs, MobiKin Doctor for iOS will supports more than 10 types of files without limitation. So that you can use it to restore any data as you like. 1. Recover 10+ types of files from iPhone, iPad and iPod touch easily, including SMS, contacts, call history, safari, notes, calendar, reminders, voice memos, photos, SMS attachments, etc. 2. Provide users with two different recovery modes to find back the deleted, lost or formatted contacts, SMS, photos and more. 3. Compatible with all generations of iDevices, including the latest iPhone 5S/5C, iPhone 5, iPad Air, the new iPad, iPad 2, iPod touch, iPod nano, iPod shuffle, etc. 4. 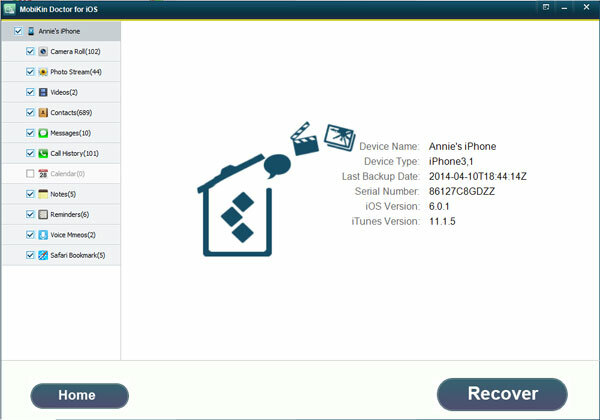 Backup the whole contents of iDevice in 3 simple steps: Scan - Select - Backup.